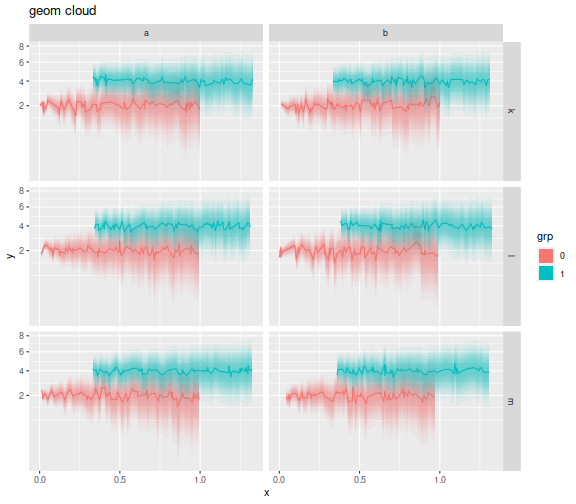 I wanted a drop-in replacement for geom_errorbar in ggplot2 that would plot a density cloud of uncertainty. The idea is that typically (well, where I work), the ymin and ymax of an errorbar are plotted at plus and minus one standard deviation. A 'cloud' where the alpha is proportional to a normal density with the same standard deviations could show the same information on a plot with a little less clutter. I found out how to do this with a very ugly function, but wanted to do it the 'right' way by spawning my own geom. So the geom_cloud. After looking at a bunch of other ggplot2 extensions, some amount of tinkering and hair-pulling, and we have the following code. The first part just computes standard deviations which are equally spaced in normal density. This is then used to create a list of geom_ribbon with equal alpha, but the right size. A little trickery is used to get the scales right. There are three parameters: the steps, which control how many ribbons are drawn. The default value is a little conservative. A larger value, like 15, gives very smooth clouds. The se_mult is the number of standard deviations that the ymax and ymin are plotted at, defaulting to 1 here. If you plot your errorbars at 2 standard errors, change this to 2. The max_alpha is the alpha at the maximal density, i.e. around y. # perhaps use ppoints instead? # 2FIX: use the coordinate transform? or just forget it? geom_cloud(aes(fill=grp),steps=15,max_alpha=0.85,color=NA) +   # important! set color to NA! At some point I will put this in a package or try to push it off into one of the fine ggplot2 extension packages. There are still some bugs to be worked out: I would like the fill to default to the color if the fill is not given. I want to force the color to be NA, otherwise geom_ribbon adds really ugly lines, and so on.